The release of FileAudit 5.5 is focused on helping IT administrators better identify and analyze abnormal file activity. Sometimes the challenge with data breaches is to know they even happened at all, with the average number of days needed to discover a breach being 191 days1. However, should protected data reside on a file server, obvious leading indicators of a breach will exist. By monitoring the access and usage of protected data on file servers, it is possible to detect a data breach based on unusual or abnormal activity. This new dashboard provides a detailed activity report on all file and folders a specified user has accessed, or attempted to access. Click on any user from the File Access Viewer or Statistics to see all events performed in the previous 4 weeks. The Top 5 accessed files. 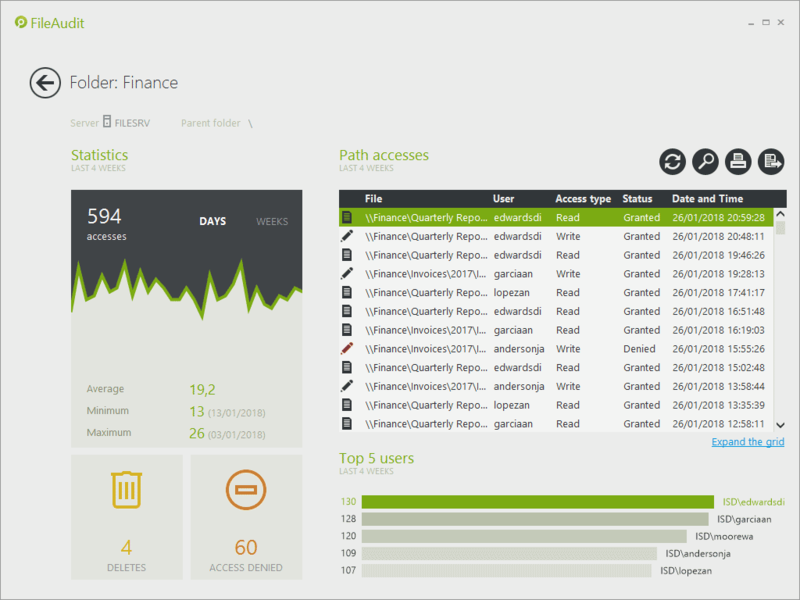 This new dashboard provides a detailed activity report on the access to a specified file or folder from all users. Click on any file or folder path from the File Access Viewer or Statistics to see all events performed in the previous 4 weeks. The Top 5 users who have accessed this file or folder. Double clicking on the access event will now bring up the full event details. Should the organization need to access archived records for regulatory compliance or to investigate an historical incident, a new tool (FileAuditReporter) is now available in the installation folder. This tool allows you to easily retrieve, analyze and report on archived data. Integrating Slack with FileAudit can help the whole IT team to be more reactive to alerts, track issues and share reports. Any message from FileAudit (alert, scheduled report, warning message) can be sent to a shared channel or direct message in Slack. More info. A new option now exists to keep all historical reports. (You can if required, still automatically overwrite the old scheduled report with the latest version). There is also no obligation to email the report and the exact folder can be defined to where the scheduled reports are saved. More info. Ability to restart the FileAudit service when changing remote connection settings. More info. In addition to the IP address, FileAudit 5.2 now provides the machine name from which a user accessed a file/folder through the network. This further strengthens the identification of any access made to help attribute access to an individual user and identify potential suspicious activities. FileAudit 5.2 has introduced a new filtering criteria that allows you to focus on access events for one or more Active Directory Groups. From the FileAudit console, browse and identify Active Directory Groups to configure alerts, schedule reports or apply as a criteria from the ‘File Access Viewer’. Group filters can be used to either exclude or include group members. 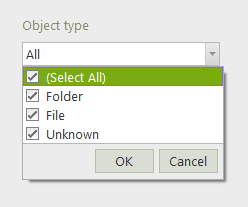 With FileAudit 5.2, administrators can now have the option to distinguish between a file and folder. You can apply this criteria from the ‘File access view’. 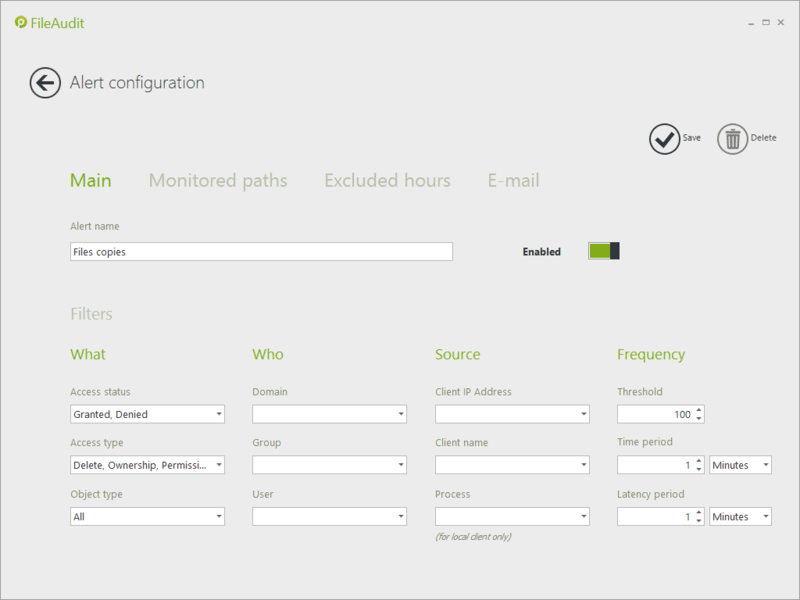 Alternatively it can be used when configuring any access alerts or scheduling access reports. This optimization helps keep your audit trail more meaningful. 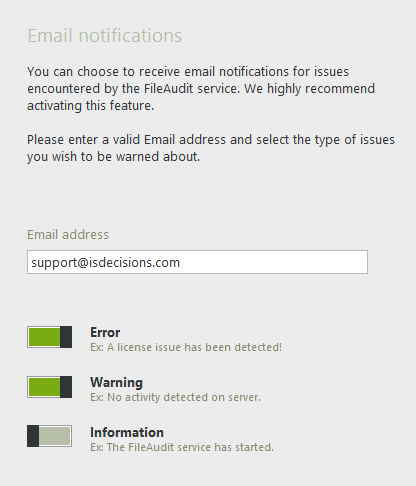 Receive email alerts about issues that the FileAudit service has met. Determine the type of alerts you want to be notified about: Error, Warning and Information. An alert warns the administrator when FileAudit has not monitored a file access event for more than three consecutive days on a specific server. This alert is both on the FileAudit console and sent by email. This can highlight to an administrator an issue that needs to be addressed — for example if the object access audit policy is disabled, the NTFS audit configuration is deleted or the security log is corrupted or misconfigured. FileAudit 5.2 supports Windows Server 2016. FileAudit now detects the IP address of the machine from which the file/folder access has been performed. When the access is performed directly on the file server hosting the file/folder accessed (local access), FileAudit displays in the column ‘Source’ the name of the process from which the user has accessed the file. When the file/folder is accessed through the network, this ‘Source’ column displays the IP address of the machine from which the user has performed the access. A list of every access made from a specific IP address, and thus a specific machine, can be made using FileAudit’s filtering capabilities. Administrators can apply this criteria from the ‘File access viewer’. As a selected criteria for a scheduled report. A new type of alert allows administrators to monitor the frequency of an access type to files/folders performed by the same user. Alerts can be triggered when a user performs a number of accesses deemed beyond the tolerated threshold for a defined period of time. When a significant number of read accesses are performed during a short period of time, the probability is that the user has executed a copy/paste file operation. The alert indicates the user name, the date and time of the violation as well as the alert parameters, making it easy to further investigate within FileAudit the full access history. When configuring alerts, a new tab allows administrators to define, as additional criteria, the business days and hours during which access to the specified path is considered as normal. All access out of the hours configured in this tab will then be considered as abnormal and will trigger the alert if the other criteria are also satisfied. Example of a week for which access to the designated files/folders will be considered as normal. If all criteria defined in the ‘Main’ tab are filled, the alert will be triggered if an access is performed before 8:00 AM or after 7:00 PM from Monday to Friday, or if an access is performed during the weekend. FileAudit now supports MySQL as database system. Choose the path(s) on which you want to displays access statistics and graphs in the ‘Statistics’ view amongst all the paths registered as audited. Add a corporate logo in the printed/exported reports. Check the availability of new versions, direct from the FileAudit Console.